NBA Countdown analyst Paul Pierce has found himself in the middle of a bizarre controversy by refusing to share his tribute night with Cavs guard Isaiah Thomas, who returns to TD Garden the same night after being traded from Boston last summer. 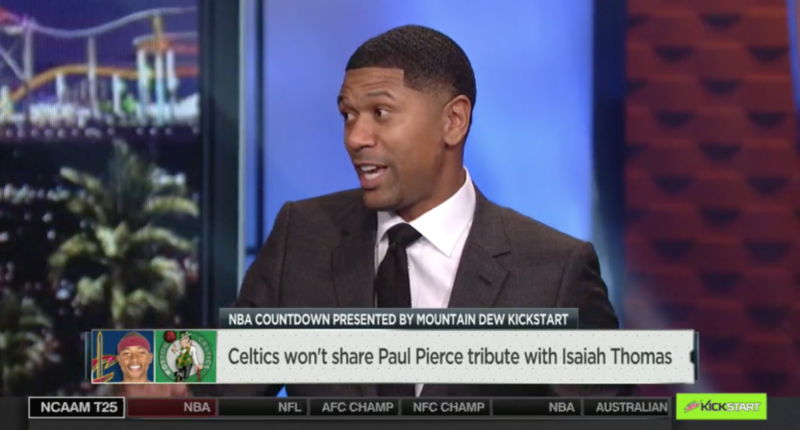 During Wednesday’s NBA Countdown broadcast, Jalen Rose dug into Pierce’s handling of the situation, calling the Celtics great “petty,” while sitting only feet away from him. Pierce gave his retort, with some support from Tracy McGrady, before Rose responded with a metaphor that didn’t really fit. Rose: Can I tell you something about your birthday? It ain’t only your birthday. A lot of people’s birthdays happen that time. You have to have quite an ego to raise the fuss Pierce did, but that ego probably helped Pierce during his career as a 10-time All-Star and 2008 NBA Finals MVP. Thomas’ time in Boston obviously isn’t nearly as legendary as Pierce’s. Thomas spent only two and a half seasons with the Celtics, while Pierce played for them from the 1998 draft through the historically and hilariously lopsided trade between the Celtics and the Nets in 2013 and won an NBA title in 2008. But IT did lead the Celtics to the Eastern Conference Finals last year before being discarded in the Kyrie Irving deal, so Celtics fans might have enjoyed giving him his due respect.